Barkisland warmed up for today’s Sykes Cup semi-final at Kirkburton by hitting one of the highest totals in Huddersfield League history. Darren Robinson’s men piled up 424 for four at home to top section newcomers Moorlands yesterday to set up a 157-run victory. Second-wicket pair Tim Seifert and Alex Kaye did the damage with a huge stand. Young Kiwi Seifert showed just how to improve your batting average in one go with 239 and former Halifax League player Kaye made 148. Shellshocked Dewsbury side Moorlands recovered enough composure to also do justice to a good wicket, making 267 in reply. Barkisland remain sixth, just below Delph and Dobcross who beat them in the Twenty/20 quarter finals on Friday when Seifert made 80 and Greg Buckley 110 for the visitors. Elland are fourth from bottom after second-placed Hoylandswaine made light work of chasing 2142 to win at Hullen Edge, Ryan Robinson plundering 135 not out. Earlier, Brad Birkhead and Robin Broom had made 56 each for Elland. Walsden maintained their 12 point lead over Norden at the top of the Central Lancashire League after both sides picked up four points. The Scott Street men won by five wickets at Clifton. Sri Lankan Umesh Karunaratne has now hit top form and his two for 54 off 20 overs kept Clifton in check at 204 for seven. He then made 47 not out as Walsden chased down a reduced target. 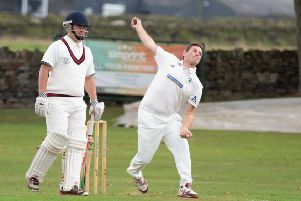 Todmorden put some indifferent form behind them with a nine-wicket home romp against Nelson in the Lancashire League. Their Pakistani quick bowler Bilawal Bhatti did the damage, taking six for 33 to help dismiss the visitors for 123. Opener Simon Newbitt hit an unbeaten 52, shared stands of 59 with Ben Sutcliffe (14) and 65 with Ben Pearson (22 no) to secure victory in the 28th over. It was a disappointing day for Calderdale pair Lightcliffe and Brighouse in the Bradford League. Lightcliffe, at home to Pudsey Congs in the Priestley Cup semi-finals today, lost by six wickets to the team they knocked out in the third round, champions Cleckheaton. Skipper Alex Stead maintained his good form with 52 and Rhys Jowett hit 38 but the home side struggled to cope with slow bowlers Tanzeel Altaf (six for 43) and Andrew Deegan (three for 38). Ex-Lightcliffe batsman Andy Garrod then made a fluent 65 to help Cleckheaton comfortably overhaul Lightcliffe’s 160. Brighouse lost by 118 runs away to promotion hopefuls Baildon in Division Two. Aleem Ladak and Mohammed Zahid took four wickets each as Baildon made 226, home skipper Simon Bailey hitting an unbeaten 80. However, Brighouse struggled with the bat again and were all out for 108 with Mohammed Khurshid (40) again lacking support. Shakeel Mahmood again made runs down the order for Northowram Fields but his 77 was to no avail at East Ardsley where the visitors lost their final wicket with three balls left, falling 10 runs short of the home side’s 225 for nine. Illingworth lost by three wickets at Colton in the Aire/Wharfe League’s middle section with Nigel Danby’s 67 not out tipping an even contest the home side’s way. Barkisland won by 157 runs. Barkisland 6 pts, Moorlands 0 pts. Bowling: C Lloyd 15 2 146 1, D Sykes 14 1 99 3, A Walker 4 0 38 0, O Kilburn 4 0 38 0, P Lombard 6 0 38 0, D Winn 4 1 28 0, R Ali 3 0 30 0. Bowling: A Scholefield 7 3 18 1, J Finch 7 1 39 1, C Williams 13 1 73 3, M Steers 10 2 41 1, D Robinson 4 0 30 0, J Summerscales 4 0 45 2, L Bridges 1.1 0 15 1. Hoylandswaine won by 7 wkts. Hoylandswaine 6 pts, Elland 0 pts. Bowling: K Williams 14 0 67 5, Y Abbas 7 2 23 1, J Iqbal 4 0 28 0, R Wilkinson 15 c1 59 3, S P Singh 10 2 54 0. Bowling: N Desai 5 0 33 1, A Finn 7 0 43 1, S Sajid 7 1 34 1, R Broom 7 0 44 0, M Hinchliffe 2 0 30 0, W Gardner 3 1 25 0, N Lockley 4 1 27 0. Walsden won by 5 wickets. Clifton 0 pts, Walsden 4 pts. Bowling: J Shackleton 6.0 0 40 0, S Barker 11.0 1 36 1, U Karunaratime 20.0 5 54 2, Josh Gale 4.0 0 17 0, J Hooson 3.0 0 18 0, Joe Gale 6.0 0 36 2. Bowling: S Cheetham 14.0 2 50 0, G Jennings 14.0 1 87 4, G Cross 9.3 0 41 1. Todmorden won by 9 wickets. Todmorden 12 pts, Nelson 0 pts. Bowling: B Bhatti 11.2 1 33 6, Harlow 14 0 68 2, Priestley 5 2 16 2, Hamza Ali 2 0 3 0. Bowling: Klein 9 1 41 1, Meade 6 0 25 0, Phelan 4 0 13 0, Thompson 3 0 10 0, Nazir 3 1 4 0, Khalid 2 0 22 0, Hussain 0.2 0 5 0. Cleckheaton won by 6 wickets. Cleckheaton 17 pts, Lightcliffe 3 pts. Bowling: C Free 9.0 1 32 0, I Wood 10.0 1 41 1, T Altaf 14.5 3 43 6 A Deegan 13.0 2 38 3. Bowling: R Burton 4.0 0 21 0, J Whiteoak 2.0 0 19 0, S Khan 7.2 0 33 1, C Greenwood 4.0 0 35 0, J Wheatley 8.0 1 27 2, D Ahmed 5.0 0 25 1. Bowling: N Hussain 15.0 2 77 1, A Ladak 9.3 1 57 4, M Zahid 15.0 2 43 4, G Makwana 10.0 1 47 1. Bowling: W Maqsood 9.0 3 23 3, T Khan 5.0 1 23 0, S Bailey 10.0 1 34 1, M Ahmed 10.0 6 9 3, J Abbott 3.0 2 8 2. East Ardsley won by 10 runs. East Ardsley 6 pts, Northowram Fields 1 pt. Bowling: Z Khan 11 2 53 3, W Parkin 6 2 21 0, J Smith 15 2 55 4, J Norcliffe 15 2 57 2, J Lee 3 0 36 0. Bowling: A Pearson 13 0 73 1, S Mullins 7 1 31 1, A Pearson 12 0 44 3, A Battye 13 1 43 1, D Battye 4.3 0 19 3. Bowling: T Glover 11.0 2 42 2, D Wright 9.0 2 49 1, A Scholes 8.0 2 23 1, T Horner 8.0 1 31 1, J Horner 14.0 1 68 3. Bowling: J Moorhouse 10.0 1 35 0, L Kelly 14.0 2 49 4, S Cook 10.0 0 39 0, L Brooksby 10.0 1 56 2, B Robertshaw 4.0 0 28 1.